In September, 2006, as I meandered along the banks of Cayuga Inlet (also definitely occurs in Fall Creek valley), I noticed a gorgeous, elegant, exotic, tropical-looking flower at the top of a 5 ft. vine. The stem was thin and fragile. The 4 - 8 in. alternate leaves were pinnately divided into an odd number of egg shaped leaflets, often partly folded along the midrib. This native plant turned out to be Apios americana. Hopniss is what Native Americans called this important food crop. Its common name today is groundnut. Some alternative names are: American potato bean, wild bean, Indian potato, ground bean and sea vines. It was originally given the genus name Glycine by Linnaeus (1737) in his first edition of "Genera Plantarum." The word glycine is derived from the Greek - glykys (sweet) - and very likely refers to the sweetness of the pear-shaped (apios in Greek) edible tubers produced by the native North American twining or climbing herbaceous legume, Glycine apios, now known as Apios americana. It saved the Massachusetts Bay Pilgrims from starvation during those first hard winters. 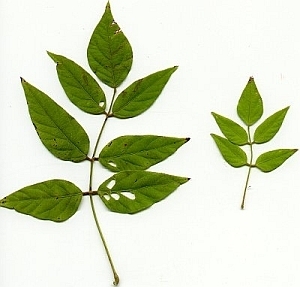 The cultivated soybean first appeared in the Species Plantarum, Linnaeus, under the name Phaseolus max L. However, the combination, Glycine max (L.) Merr., as proposed by Merrill in 1917, has become the valid name for this immensely valuable plant. Hopniss is a perennial vine growing to 10 ft. with fragrant, aromatic flowers that bloom from July to October. 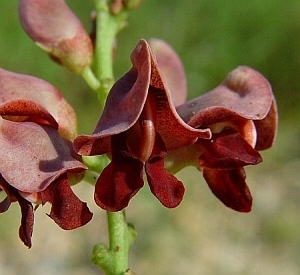 The flowers are pink on the outside, and maroon to a rich brown on the inside . Top of flower has a curved horn-like structure. They are arranged in dense, conical clusters (racemes) arising from the leaf axil; pea-like, yet unique and distinctive. In late summer and autumn, 2 - 5 inch , linear pods appear each containing a few beans that are edible when cooked. In the northern part of its range this plant only rarely sets seed, but in the southern part of its range it does so regularly. This legume has a cord-like rootstock with underground edible tubers. These are produced in chains of anywhere from 2 to 20 with variable spacing between them. The tubers are connected by a rhizome of variable thickness often forming an interconnected network under colonies of hopniss vines. The tubers range from the size of a grape to larger than a grapefruit. Most commonly, they are about an inch thick, 1.5 in. long and pear shaped. A latex soon appears on damaged parts of the plant. Hopniss is widespread in eastern North America: New Brunswick and Nova Scotia; New England south to Florida; west to Louisiana and Texas; north to the Great Lakes area. Its habitat is moist thickets, moist woods, stream banks, flood plains, and lake edges. It thrives in full to partial sun. The tubers can be dug at any time of the year provided that the ground is not frozen solid. Sometimes they will be right on the surface but usually are 1 to 6 in. deep. Occasionally, chains of tubers can be found washed out of the soil by spring floods. The tubers contain 17% high quality legume protein (comparable to soy protein and many times more than potatoes), 3.5% fat (linoleic acid predominates), 5% ash, and 73% total carbohydrate. It can be used in soups and stews or fried like potatoes, roasted, or ground into flour for bread. The flavor of this vegetable is somewhere between peanuts and potatoes, but unique and distinctive.